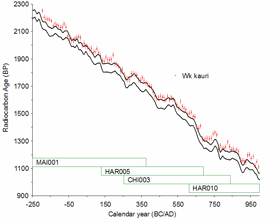 14C measurements from dendrochronologically-dated New Zealand kauri; overlain by the Northern hemisphere calibration curve (IntCal09). The tree-ring periods covered by the 4 trees utilized in this study are also shown. Radiocarbon dating is the most widely used tool for helping to define geological, palaeoenvironmental and archaeological events that have shaped the last 60,000 years. However, atmospheric 14C concentration has varied through time due to cosmic ray fluctuations. This means that 14C dates do not equate directly with calendar time and must be corrected using a calibration curve (constructed by 14C dating of samples of known calendar age, such as tree rings). The Waikato Radiocarbon team, lead by Assoc. Prof. Alan Hogg, has been instrumental in the development of the Southern Hemisphere terrestrial calibration curve (SHCal13) and the Northern Hemisphere terrestrial curve (IntCal13). SHCal13 incorporates new data sets, extending measurements to 2145 cal BP with modeled data extending back to 50,000 cal BP using an inter-hemispheric offset averaging 43±23 years. The papers describing the use of these curves are published in Radiocarbon: SHCal13 - Hogg et al 2013a and IntCal13 – Reimer et al 2013. Hogg A, C Turney, J Palmer, E Cook, B Buckley, 2013. Is there any evidence for regional 14C offsets in the Southern Hemisphere? Radiocarbon, 55(4): doi: 10.2458/azu_js_rc.v55i2.16104. Hogg A, J Palmer, G Boswijk, C Turney, 2011. High-precision radiocarbon measurements of tree-ring dated wood from New Zealand: 195 BC – AD 995. Radiocarbon, 53(3):529-542. Hogg, A, C Bronk Ramsey, C Turney, J Palmer, 2009. Bayesian evaluation of the Southern Hemisphere radiocarbon offset during the Holocene. Radiocarbon, 51(4):1165-1176. McCormac, FG, AG Hogg, PG Blackwell, CE Buck, TFG Higham, PJ Reimer, 2004. SHCal04 Southern Hemisphere calibration, 0 – 26 ka cal BP. Radiocarbon, 46 (3):1087-1092. Hogg, AG, FG McCormac, TFG Higham, PJ Reimer, MGL Baille, JG Palmer, 2002. High-precision radiocarbon measurements of contemporaneous tree-ring dated wood from the British Isles and New Zealand: AD 1850-950, Radiocarbon, 44 (3) 633-640.